work over 12 years and I was familiar with Dohnanyi’s impossible piano finger exercises. But it was Liszt who provided the profile and the funding to enable the Academy to be constructed, even though he spent most of his time in Austria and was reputed to speak no Hungarian. His statue, with its graceful fingers sits in the square leading to the Academy. The Academy was opened in 1907, and the architecture follows the European Art Nouveau (Jugenstil or Austrian Secessian) tradition, featuring the unique ceramics from the Zsolnay ceramic factory in Pecs. It is ornate with features of Greek mythology, matched with lead lights and geometric patterns. Again it was our 3rd attempt to hear a concert in the Academy, which had been closed for its centenary refurbishment in 2008 and 2012. Unbelievably, we discovered we could get tickets for a free concert of student final examination performances. So we rocked up at 7pm to hear a young pianist perform a Bach concerto with chamber orchestra and a solo performance on a huge Steinway piano. We were in row 4 and we were probably listening to a soon-to-be-famous performer. On Sunday evening, being Orthodox Pentecost (of course! ), we queued with hundreds of locals outside Szvent Istvan’s Basilica – the huge St Stephen’s Cathedral – to hear a poly choral concert of St Ephraim’s male choir and a percussion group. 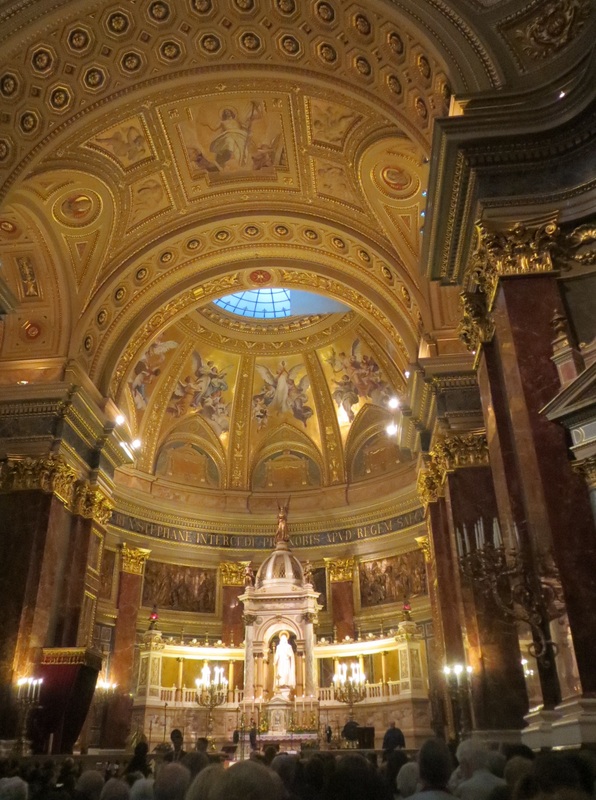 The cathedral was built in 1870’s under the reign of Emperor Franz Joseph, the last of the Hapsburg Austro-Hungarian monarchs. The vast interior is lined with 24 carat gold leaf and the columns supported by pink, red, green and ivory marble from Transylvania. 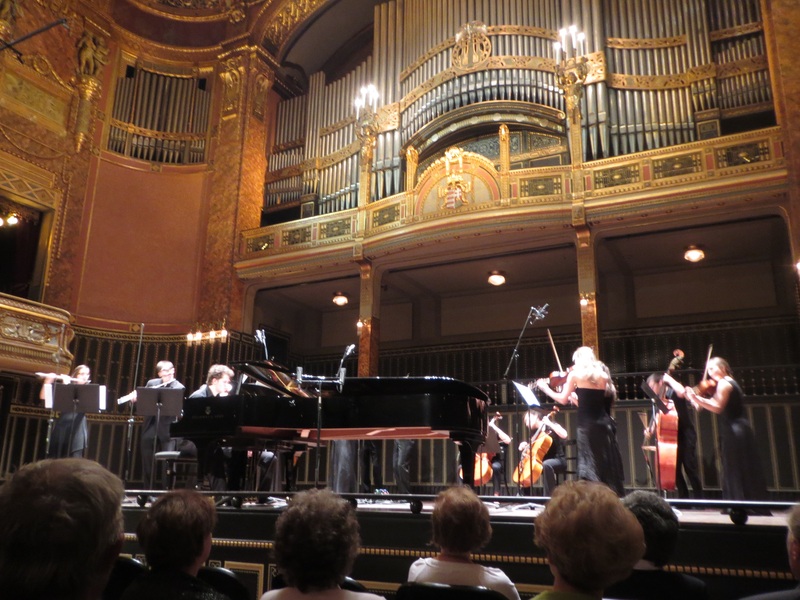 The concert was really a church service and the audience participated in refrains which were printed on the program. Just as well we knew our ‘sol fa’ because we certainly could not pronounce the text! The music was strangely modern, the male choristers however were in medieval gowns and their singing superb. 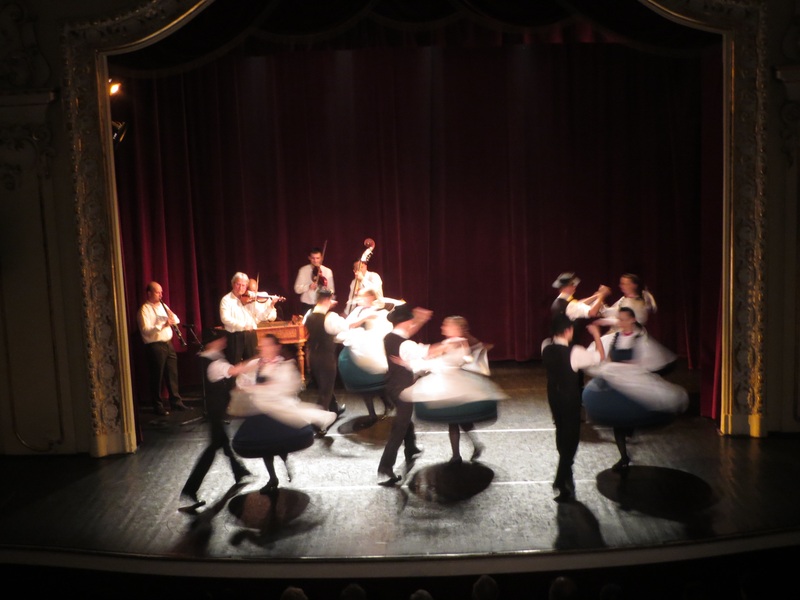 Our next musical experience was the Hungarian Dance Rhapsody in the Duna Palota (Danube Palace). 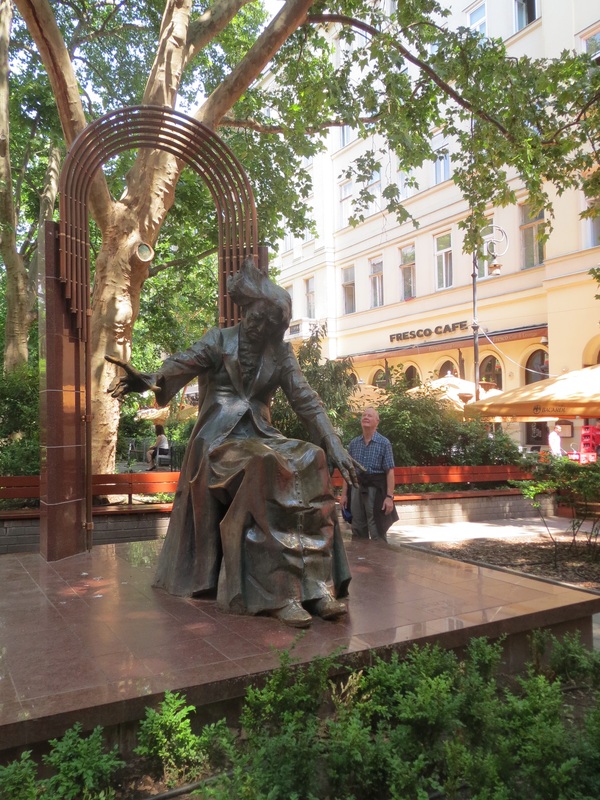 This was no kitschy tourist experience but a demonstration of dance and live music performance based on Bartok’s music. 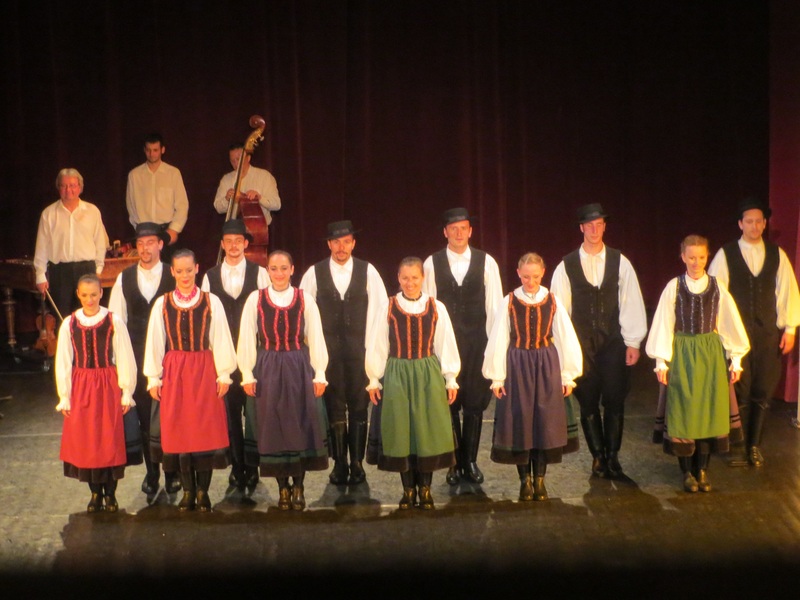 The program stated that the Dance Rhapsody is a performance of free dance structure which gives the impression of folk dances. Six young couples gave an extraordinary display of athletic and rhythmic dancing, from unpronounceable places like Marossarpatak, Rabakoz and Kukullomente. The small live orchestra included two violins, a double bass, a type of wooden zylophone and wind instrument- either piccolo or clarinet or sometimes a type of bagpipe. The music was strangely pitched, not melodic but with a strong beat. The dancers often chanted and sang as they danced, the women wearing long swinging dresses and floating ribbons in their hair. The men wore long black leather boots and jodhpurs, often with a smart felt hat and their dancing was often a cross between Cossack and German/Austrian Schuhplatter, where the leather boots are slapped loudly with their hands and lots of stamping, leaping and squatting. It was unbelievably riveting. Our next music adventure will be back at the Academy tonight for the final examination of 3 conducting students. Our guide on the tour of the Academy told us that a diploma from here is considered one of the best in the world!